Discover the four leaf clover shaped land of Myanmar within 13 days as you come to several significant destinations of Myanmar and befriend with its nice people. As the leaves of clover represent faith, hope, love, and luck respectively, you might find these in this unique land. With thousands of golden stupas and pagodas co-existing with a slow, peaceful lifestyle, Myanmar is full of mysteries. Upon your arrival at Yangon International Airport, you will be warmly welcomed and then transferred to your hotel for check in. Afternoon is time for you to discover Yangon's highlighted destinations. It all starts with a visit to Chaukhtatgyi Temple which holds the biggest reclining Buddha statue in Southeast Asia. Then, wander around Sule Pagoda which is Myanmar's oldest pagoda of 2,500 years old. Afterwards, drop by Maha Bandoola Garden which contains the Independence Monument commemorating when Burma was free from British colonization in 1948. When the sun sets, you will experience the inspiring wonder of Shwedagon Pagoda - Yangon's most famous attraction, being left breathless with its vivid color and sacred atmosphere. After having breakfast, we will head to Twante which is a small town near Yangon noted for its ceramics and bamboo fabric. Sail along Yangon River to the south, catching sight of locals' morning activities at the two riverbanks. Everything seems to be in slow motion, giving you relief and tranquility. When you disembark, access Twante's Shwesandaw Pagoda - one of the four Buddhist sites in Myanmar carrying this name, meaning 'golden hair relics'. Next, visit the ceramic sheds of Oh Bo where you can make ceramic pot by yourself and decorate in your own style. Also, you can buy some pottery back home as gifts for your friends or family members. Continue exploring Twante by heading to local workshop making bamboo raft and tasting various fresh, delicious food in local market. Along the way back to Yangon, we will take you to Paung Daw Gyoke Pagoda which is located at the center of a peaceful lake, surrounded by lotus and fish. After breakfast, let us transfer you to the airport for a morning flight to Nyaung U. After checking in at your hotel in Bagan, visit Shwezigon Pagoda reported to enshrine Gautama Buddha's relics, Ananda Temple which is home to four Buddha standing statues - each faces one of the four cardinal directions, and Sulamani Temple, a Buddhist edifice rebuilt in 1994 from which Htilominlo Temple was built after. In the afternoon, take a horse cart to Nan Paya Temple, one among three pagodas built from sandstones in Bagan and also one of its largest pagodas. Highlight of today tour is the breathtaking sunset view at Shwesandaw Pagoda, the second tallest Buddhist construction in Bagan. In the morning, head to Nyaung U Market where local products are boisterously bought and sold - you can get some real bargains there as souvenirs. In the afternoon, come to lacquer ware workshop to observe what they are made of. Next, visit Dhammayazika, a five-sided pagoda complex where in each side there is a small temple housing a Buddha statue. As the sun is about to set, sail down the Ayeyarwaddy River to reach Kyauk Gu U Min, a cave temple with excellent sandstone carvings and giant Buddha images. Splendid natural settings blend perfectly with antique humans' construction, surely an ideal place to enjoy dusk. In the morning, take one hour drive from Bagan to Mt. Popa, an inactive volcano of 1518 meters high including 777 stair steps. Its name derives from a Sanskrit word meaning 'flower'. When you are at the top of the mountain, catch sight of the whole area around, including the Ayeyarwaddy River, surrounding villages, temples and shrines. In the afternoon, head to Sale (also known as Salay) which is situated at the eastern bank of Ayeyarwaddy River and famous for its sacred monasteries and exquisite wood carvings; there, visit Shinbin Maha Laba Man Paya which contains Myanmar's biggest lacquer Buddha image and Yoke Sone Kyaung where beautiful wood crafts from the 19th century can be found. 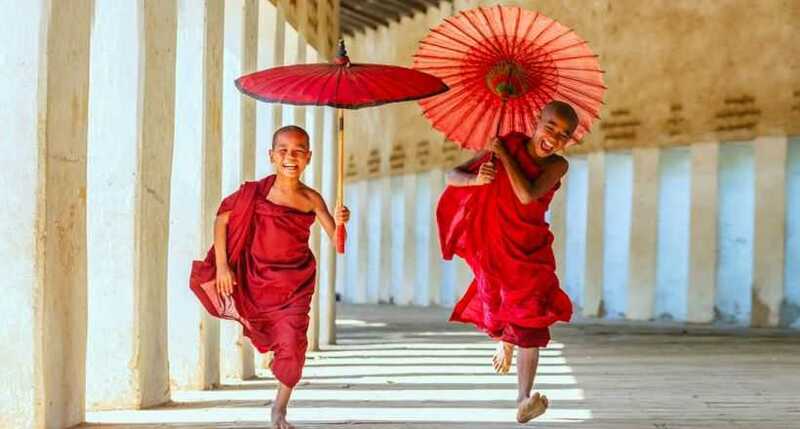 After having breakfast, you will be taken to Pakoku, a prosperous town near Bagan, and drop by weaving and cheroot making workshops - parts of what make Pakokku famous. Surely you will be amazed with the whole process; you can buy some home as souvenirs for family and friends. Next, head to Monywa - an important Buddhism hub of Myanmar - and immerse yourself in attractive scenes, peaceful ambiance along the way and also the stunning sunset at the bank of Chinwin River. In the morning, after breakfast, we will drive you to Phowintaung, a complex of 937 caves decorated with numerous wonderful Buddha images and wall paintings. Afterward, drop by copper workshop and witness the Myanmar traditional way of forging this kind of metal. In the afternoon, we will visit Thanboddhay Pagoda, a spectacular edifice with over 500,000 Buddha statues, together with countless golden pillars and colorful stupas. 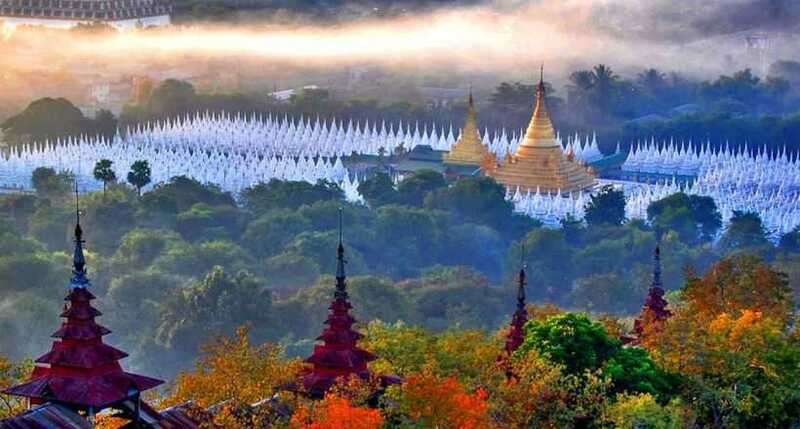 Drive to Mandalay, drop by Kaungmhudaw Pagoda, silver ware workshop, Sagaing Hill, enjoy sunset at U Bein Bridge. On this day, we will transfer you to Mandalay. Along the way, catch sight of typical Myanmar rural lives through lush green paddies, verdant orchards, bright sunflower fields and most importantly warm smiles of locals. The first stop of today routine is Kaungmhudaw Pagoda, a unique stupa in egg-shaped design. Next, head to Ywadaung Village and visit silver ware workshop there - this is also a chance for you to truly meet and communicate with Myanmar people. After that, hike up to the top of Sagaing Hill to capture the whole view of misty city and river. Then, we will move to Amarapura and enjoy sunset view at U Bein Bridge - the world's most extended teak bridge. Lastly, you will be driven to your hotel in Mandalay for check-in. Stay overnight in Mandalay. Now you are in Mandalay, Myanmar's hub of Buddhism filled with various stupas and monasteries. Firstly, head to Mahamuni Buddha Temple to see Mahamuni Image - a bronze Buddha statue originally from Rakhine State. Being made during the Buddha's own lifetime, the image is considered a representation his life. Then, come to Mandalay Palace - the last royal construction of Burmese Kingdoms; Shwenandaw Monastery - literally means Golden Palace Monastery, famous for its delicate teak carvings; Atumashi Monastery - a Buddhist edifice originally built from teak in 1857 before destruction and then rebuilt in 1996; and Kuthodaw Pagoda, formerly Mahalawka Marazein, which contains the world's biggest book. Finally, go up to the top of the 236 meter high Mandalay Hill which gives Mandalay its name and enjoy the city's miraculous view among sunset. Stay overnight in Mandalay. In the morning, head to Mandalay port and get off a private boat to Mingun. Following the river upstream, you are about to visit the gigantic 90 ton Mingun Bell as well as the giant yet unfinished Mingun Pahtodawgyi. In the afternoon, take a half-hour flight to Heho and then an hour drive to Inle Lake - Myanmar's second largest lake and also the habitat of the extraordinary one leg rower Intha people. On this day, discover how amazingly beautiful Inle lake is through a boat trip, catching into sight the scenic settings of floating gardens, markets, villages, and pagodas nearby. After having breakfast, start your full day of sightseeing at the local market where various goods made by Shan State's hill tribe people can be found. Continue Inle Lake exploration by observing Intha people's one-of-a-kind talent of rowing by only one leg. Take a closer approach to local fishermen, finding out how they catch fish. Next, visit Phaungdawoo Pagoda, one of the principal shrines in Myanmar, presenting the most extraordinary Buddha images. Plus, stop at local workshops which make silk, cotton, lotus weaving, and cigarette to get the honest sense of local life. Finish the day by enjoying the setting sun, a pleasant experience. Say farewell to Inle Lake before take a flight to comeback to Yangon. After your hotel check-in, you can buy goods from all part of Myanmar at Bogyoke market and then walk around China Town to experience the city in a new, fresh way. Take a stroll at the riverbank to end the day. Spend your day as you wish before the departure flight from Yangon.